Are you tired of people thinking that you're NOT a witch? You spend all that time learning magic spells and then people go around thinking that you're just some normal girl. Not any more. Plant this witch sign outside your door and everyone will know what kind of wicked, spell casting, trouble-making, girl you really are! This owl decoration brings a spooky yet classy look to your home decor for the season. You'll really have a great looking party when you place it on your table. And he's elegant enough that you can keep him out all year long if you want to! "Hoot hoot hoooo is eating all of the treats?" Set up this owl at your party and he'll be a watchful guard over all of your snacks and treats. If any of your guests were thinking about taking more than their fair share, he'll make them think twice with just one glance.This owl makes the perfect decoration to complete your party scene! Add this 10" White Potion Bottle with Owl Stopper to your collection of wicked potions. It will look great in your liquor cabinet. As a plus, all of your guests will be convinced that you're secretly practicing witchcraft! When you have this 11" Flying Ghost hanging around, he'll add a whimsical touch to your decor. Maybe get several--you wouldn't want him to be lonely. Would you? And this ghostly ghoul to your holiday scene. He'll light up and hang out, but he's a little bit of a slouch conversation wise. We tried to get some boos out of him, but he wouldn't even mutter a peep! We'll just have to chalk it up to him saving his best for your trick or treaters! This 11.75'' Coach Lantern looks like one your pioneer ancestors might have used. Let it add to your spooky or historic decor scheme. Use a pillar, votive or tea-light candle inside. Add a dash of spooky fun to your decor by hanging this 12" Black Boo Cutout Wall Plaque! It can fit in almost any space or decor, and has its own hanger on the back. Greet guests by placing on your front door or in your entryway. Or startle them by putting it in an unexpected place. Maybe even use it at the office! You don't want to see the giant evil creature that calls this nest its home! You can use this 13'' Web Bird Nest as a bowl! Add a ghastly look to your home with this 14 inch LED Candelabra. Greet visitors with a well lit yet sinister smile. You'll send shivers down their spine as you pull back your lips to reveal two well sharpened fangs ready to be thrust into their soft necks. Do you want your kitchen table to look like it has been bewitched? Add this 14"x72" Spiderweb Table Runner across your dining room table for a haunting look that your house guests won't forget! This happy, friendly 15" Hanging Ghost is a fun addition to your Halloween decor. Hang him in a doorway or from a porch railing, and let him help greet your guests. And have a cheerful time! In a haunted house you don't expect to see shiny, polished brass candlesticks. So this 17'' Trumpet Candlestick is perfect! It may have once been polished to a brilliant shine, but now it looks old and tarnished. It's ideal to light a haunted dining table. Set the table for your macabre dinner with this Spider Placemat. We're hoping that you keep your entree selections suitable for human consumption, but if you want to serve something a little more... interesting, well, it's your party! These large lanterns will cast a spooky glow wherever you display them. Add them to your outdoor decor for an authentically scary look or use them inside as part of an equally impressive display. He's always watching you. Always! You better not do anything suspicious or he just may swoop in on you. This creepy owl is most definitely haunted and doesn't have a problem with haunting your home. In fact, he enjoys it! Set up a spooktacular floral arrangement with this Twig Spray. You can use flowers that are either dead or alive! Place this 20 Inch Purple Glittered Twig Spray in a vase next to a sparkly pumpkin so your room really glitters! Nobody knows why this tree is weeping. We didn't know that plants even had emotions! 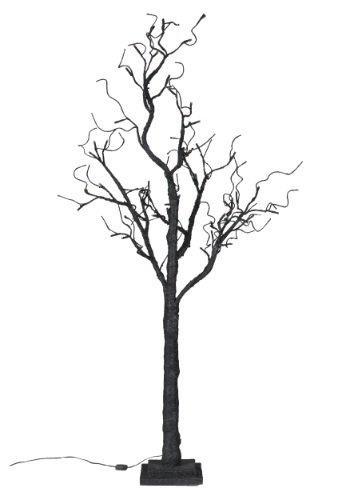 But in any case, this 20'' Black Weeping Tree can add a dramatic touch to your seasonal decor. Lenore! Just an echo you might tell yourself. Nothing more. Then you see the darkened silhouette of the shadowy raven. Perhaps it was the raven that said the name of your long lost love? No, it couldn't be?! Now, imagine that kind of echoing terror rippling through your guests as they look at this sparkling raven decoration. Creepy, right? Of course, you could always hide and yell out "Nevermore" to frighten your guests. We tried that out. It was pretty cool. This decoration looks like it just popped out of a Tim Burton movie. This cool decoration makes an eerie high pitch noise. The doors and windows also light up and change color. This decoration looks great when placed in a large picture window! Get the perfect decoration for a seasonal, fall look or for year round with this bronze vase/candle holder. It can be used to hold any variation of flowers or branches to add a sophisticated yet rustic look your your decor. did you know that there really is an actual plant called witches' grass? It's usually considered a weed by farmers, and in nature it's green. But this 27" Witches' Grass Spray can add a sinister touch to any decor! This 28" Thistle Spray is shaped just like real thistles, except it's black. Real ones are green w/ purple blooms. But for Halloween, black is a good color. Add this to any decor scheme! This 29 Inch Beaded Ice Cone will reflect light and sparkle as part of any holiday display. Surround it with twinkle lights in front of a mirror, Or use it as part of a table centerpiece arrangement. Or maybe surround it with artificial greenery. Use your imagination! This 35" Black Tree with Glitter and 30 LED Lights will add a luminous aura to any Halloween decor scheme. Put it on a shelf, or in the center of your party table. Or in a corner of the foyer. It is perfect for any spot that needs a bit of light. Are those living creatures with glowing orange eyes, or is it just this 35" Twig Tree w/Orange Lights? If you place it in a suitably dark corner, people will wonder! Use it alone, or hang pumpkin or ghost decorations on it. Make your decor as spooky as you wish! Class up your yearly Halloween decorations with this delightful (and spooky) cutout display piece! It says the word Halloween and has a nice base to keep it up all season long. It's going to look great in your foyer, living room, or any place you want to keep the fun of the season without losing your beautiful home style. This 4.5 Inch Black and White Ceramic Striped Pot is a perfect way to display a decorative arrangement of fake foliage. Or you could put a real plant, in a smaller pot, inside it on top of a layer of gravel for drainage. Use your imagination. Your home may be the picture of comfort and charm for most of the year, but for a few weeks in October you should let it be a little wicked! This detailed decoration, which spells out exactly the look you are going for, is a great way to get started on your spooky makeover for the season! Use this 5.5 Inch Black and White Ceramic Striped Pot as an outer pot for a smaller potted plant, or display seasonal foliage. Or fill it with fake skulls or body parts. Or wrapped candy. It's quite versatile. Not enough spiders in your home? That's sort of a weird problem to have, but if that's your problem, we can solve it! This glass jar comes with plenty of spiders inside and the best part about them is that you don't have to feed them, since they're toys. Spread them around your home and solve your lack-of-spiders problem today! This is a rare branch from a tree deep inside of the Haunted Forest. This kind of tree doesn't grow flowers or fruit...it grows tiny skulls! Now you can have a branch from the Haunted Forest decorating your home. 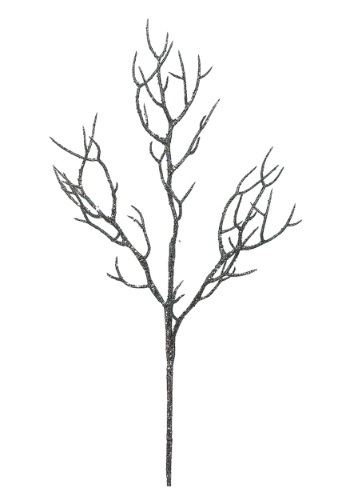 Place this 50" Black Glitter Branch w/Silver Skulls in a large vase in your house for a more festive look. Create a haunted forest in your own home with this 50" Black Tree with Glitter and 48 LED Lights! Or use it to light your foyer, or make it part of a centerpiece arrangement on a party table. Have a festive Halloween! 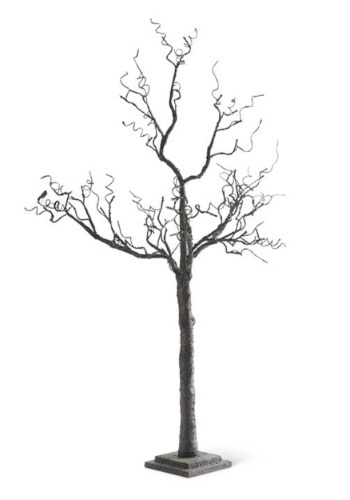 This 51" Twig Tree with Orange Lights is a perfect combination of darkness and light. It will give a spooky touch to your decor and add light at the same time. Great for a haunted forest theme. Nobody quite knows why this 55'' Standing Girl is so forlorn. But it must by a very sad story if she needs her teddy bear for comfort. If you wish, you can invent your own back-story for her. Or just leave it as a mystery for your guests to figure out. Drape this 59 Inch Glittery Black Hanging Twig Spray along the edge of a fireplace mantel, or along a stairway banister, or a porch railing. Or maybe over the top of a doorway. It would also work as part of a centerpiece arrangement on a party table.